I have included a summary of key points below. Please download full report to see fully referenced statement. Failure to meet statutory affordable housing targets. The application contains no statement on the future tenure of Balfron Tower’s 146 flats. This omission indicates full privatisation and a resultant loss of 99 homes on social rent. This is in breach of two policies in the Mayor of London’s The London Plan addressing ‘existing housing’ and ‘areas for regeneration’ which specifically state plans ‘should resist loss of housing, including affordable housing’. Furthermore, the failure to account for affordable housing is in contradiction to policy followed by precedent planning applications addressing the refurbishment of listed post-war public housing buildings in Tower Hamlets - Carradale House and Keeling House. Failure to meet best practice guidelines on inclusive consultation. Consultation on the building’s design and refurbishment works have been entirely hidden from residents, the local community and public scrutiny. 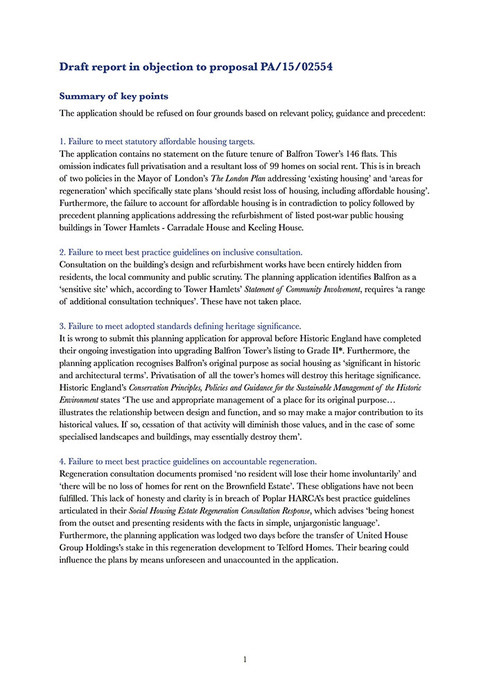 The planning application identifies Balfron as a ‘sensitive site’ which, according to Tower Hamlets’ Statement of Community Involvement, requires ‘a range of additional consultation techniques’. These have not taken place. Failure to meet adopted standards defining heritage significance. It is wrong to submit this planning application for approval before Historic England have completed their ongoing investigation into upgrading Balfron Tower’s listing to Grade II*. Furthermore, the planning application recognises Balfron’s original purpose as social housing as ‘significant in historic and architectural terms’. Privatisation of all the tower’s homes will destroy this heritage significance. Historic England’s Conservation Principles, Policies and Guidance for the Sustainable Management of the Historic Environment states ‘The use and appropriate management of a place for its original purpose… illustrates the relationship between design and function, and so may make a major contribution to its historical values. If so, cessation of that activity will diminish those values, and in the case of some specialised landscapes and buildings, may essentially destroy them’. Failure to meet best practice guidelines on accountable regeneration. Regeneration consultation documents promised ‘no resident will lose their home involuntarily’ and ‘there will be no loss of homes for rent on the Brownfield Estate’. These obligations have not been fulfilled. This lack of honesty and clarity is in breach of Poplar HARCA’s best practice guidelines articulated in their Social Housing Estate Regeneration Consultation Response, which advises ‘being honest from the outset and presenting residents with the facts in simple, unjargonistic language’. Furthermore, the planning application was lodged two days before the transfer of United House Group Holdings’s stake in this regeneration development to Telford Homes. Their bearing could influence the plans by means unforeseen and unaccounted in the application. The development partners repeat their aim for this refurbishment to be an ‘exemplar’ eighteen times in the planning application. However, rather than an exemplar, the proposals as they stand exemplify contemporary developments that segregate local communities and exemplify a unethical dispossession of social housing in London that constitutes a major contributing factor to the city’s current and much publicised housing crisis. Affordable housing – retaining a proportion of social housing, genuinely affordable to local communities, in a flagship project. Inclusive consultation – developing proposals together with current and former residents and the local estate community in which everyone is able to fully participate. Informed heritage – identifying and conserving shared historical and communal values. Accountable regeneration – opening full access to information in order to justify decisions and provide compelling evidence that every reasonable effort has been taken to minimise adverse impacts.